Please use scroll button to read entire document! The word “hell” means… Strongs #1067. geenna, gheh’-en-nah… used (fig.) as a name for the place (or state) of everlasting punishment…hell. 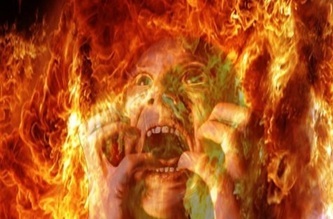 The dictionary meaning of the word “hell” basically means… the abode of condemned souls and devils in some religions; the place of eternal punishment for the wicked after death…a state of separation from God. Matthew 18:8-9…(KJV) "Wherefore if thy hand or thy foot offend thee, cut them off, and cast them from thee: it is better for thee to enter into life halt or maimed, rather than having two hands or two feet to be cast into everlasting fire.9 And if thine eye offend thee, pluck it out, and cast it from thee: it is better for thee to enter into life with one eye, rather than having two eyes to be cast into hell fire." 4. V-27… “I pray ye therefore Father”… In hell he had the ability to pray… Why wait until hell to pray?… It’s too late then… Jesus taught us to pray to the Father now… (John 16:23-27) The Father loves you now… here in this life… you can ask of Him the things you need… It’s now that we need to learn about releasing our faith. There is power in prayer… in hell there is no power in prayer… All prayer goes unanswered in hell. It’s too late to pray in hell. Hell has it’s terrors… Believe me…you don’t want to go there… There is a life after death… It’s heaven or hell… God will not force you to choose… It’s your choice… Jesus Christ died to save you from hell and from the wrath to come… Romans 1:18 says… For the wrath of God is revealed from heaven against all unrighteousness”…There is more to hell than what I have talked about in this lesson… This message has been burning in my spirit to write… Somebody needs it real soon.